What do you do with a Karaoke bar during daylight? Turn it into a coffee bar, naturally. I have walked down west 4th many a day and night and can honestly say I have never paid attention to the karaoke bar, let alone noticed this super cool coffee cupper called The Coffee Foundry. You have to keep a sharp eye out for the sandwich board out front beckoning you to pay a visit to this boutique brewer because the facade is only marked with the karaoke bar signage. 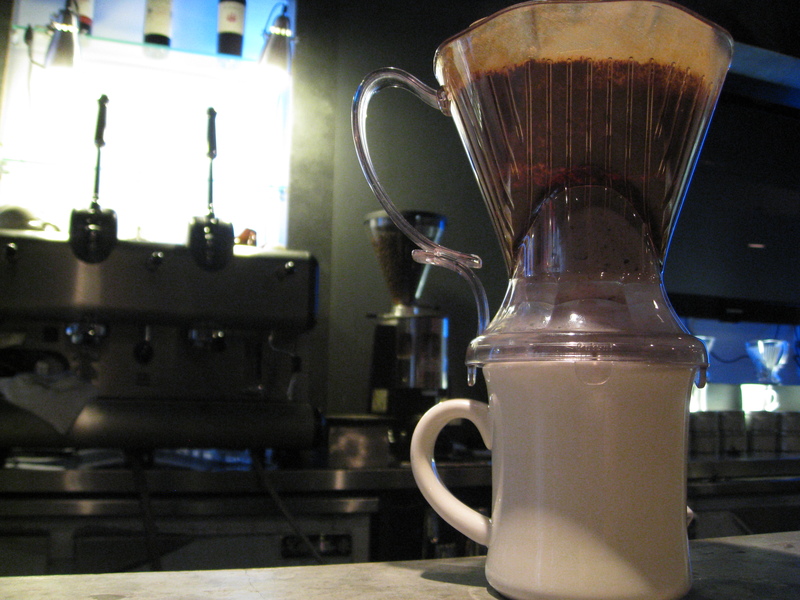 Alas, a hidden gem serving everything from single origin pour-over joe to microbrew beers. The space has the appeal of a cool late-night joint with rich blue backlighting and bar seats to perch upon while watching your cup prepared to order. The pour-over method has an entertaining appeal, but is also their preferred method of brewing to enjoy the best flavor coffee beans have to offer. And yes they even roast their own beans in LIC to ensure the freshest bean to brew possible. Using the cleverly named Clever Coffee Dripper, the brewmasters combine the best features of French press and filter drip brewing. With French press brewing, you can control steeping or infusion time, but heat loss and sediment in the cup can be a problem. Whereas, brewing with a paper filter usually loses the control over steeping time as the coffee begins to drain immediately. The Clever contraption adds a stopper to a filtercone, combining control over steeping time with a sediment-free cup. Voila, a delightful cup of hot, rich, caffeinated goodness. So next time you’re in the mood for a little coffee Journey, hang out with the very fun and knowledgable Coffee Foundry brewers. If you stay there long enough, you can witness the switchover from coffee dripper to bar shaker and move right into your best rendition of Don’t Stop Believing. A great cup of Joe – highly recommended!